Design Build students win prestigious competition sponsored by Volkswagen. 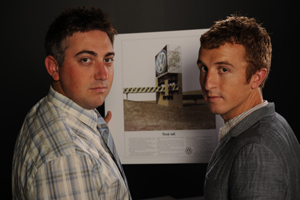 AUBURN – When Michael Glenboski and Dylan Cook won a competition sponsored by Volkswagen earlier this year, their entry solved a problem in a unique way. The contest invited architecture students from eight schools in the southeast to submit proposals for a bridge to connect employee and guest parking to the main plant. Among the problems they had to solve, there was a 700 foot span and 50 foot drop in elevation from the parking to the plant. The innovative and award winning approach? Thinking about the “incline that tired workers would face after a day at work,” Michael says. Their approach incorporated two flat spans connected by an elevator at the mid-point. No other team thought to eliminate the slope altogether. The duo believes that their design was ultimately successful because they considered worker fatigue from the beginning as part of the problem. Sustainable. Collaborative. Integrated. These hot topics are not just empty concepts in Auburn University’s Design Build program. Talking to Mike Glenboski and Dylan Cook about their winning design for a bridge at a Chattanooga, TN Volkswagen plant, this is immediately apparent. “One reason AU teams had an advantage was that our plans were more fully developed,” Mike says. With the design-build programs, the teams deliver an almost fully-buildable project, including cost estimates and lead standards, things traditional architecture programs do not concern themselves with. Normally building contractors and architects work separately and often at odds with each other. The AU program instead focuses on “integrated project delivery,” which the two students say is the new way to deliver projects in a real-world environment. Working with the building construction from the beginning “eliminates waste on the business side,” Dylan says. You could think of it as sustainability built into the actual process. This approach was clearly appealing to the contest’s judges – Auburn teams captured four out of eight total awards, though seven other universities participated in the contest. The team’s winning design was not a modest affair, though. They envisioned the two expanses of bridge connected by a giant tower that would serve as billboard space, a place to get a bird’s eye view of the plant, and possibly even a place for conference rooms, or food vendors for employees on their way to and from work. Once they conceived the tower, they said, they thought they might as well commit to it on a grand scale. The River City Company, a development group dedicated to revitalizing Chattanooga, served as the liaison between Volkswagen and the schools entering the competition. They were so pleased with results from Auburn, though, that the department has another project sponsored by the group. After finishing the bridge project, the class moved on to a new collaboration with the River City Company. In reorganized teams, the Design-Build students are next working on plans for a community library. The River City Company gave them several sites, and the teams each picked a site for which they will design a library. Each project will be carefully tailored to the surrounding community. The city gets fresh ideas and professional level projects for a bargain, and the AU students get experience and potentially a resume builder if their project is selected. In addition, the River City Company is highly focused on sustainability and “green” development through this entire revitalization mission. That is another reason the AU Design-Build program is such a good fit; this is a cornerstone of the program. Looking ahead, Mike and Dylan are optimistic. When the economy crashed, many architects found themselves looking for work and thinking about a second degree. This was the case for Dylan, who had been working with a San Diego Real Estate Development company after he finished an architecture degree from the University of Colorado, Boulder. Mike received an undergrad degree from Pratt Institute in New York and was working in New York when he decided to come back to school. “I think I’m the only one in the program who actually left a job to come here,” he says. And why did he? Both men agree that their instructor, Josh Emig, was a big consideration. He has an excellent reputation, they said. Funding, which they both received, was an additional incentive. But in the end, both men were drawn to the uniqueness of the Auburn University program, and its balanced and well-rounded curriculum.